Spring is not only a great season for weather but it’s also a great time to give your home a spring clean. Make sure that you don’t forget these important items. When it comes to keeping your home clean and tidy, there is no denying the power of your regular housework and maintenance. However, over the course of the year, junk and personal items begin to clutter up your space and surfaces until your regular cleaning is only just scratching the surface. Buffalo Builders, Inc. knows just how important it is to keep your home clean and in good repair, and has some helpful spring cleaning tips to share with you. If you have any type of air circulation system in your home, whether it’s a fully installed ducted system, a movable air conditioner, or even if it’s just a pedestal fan, it’s important that it receives a thorough clean. This means more than just wiping the fan blades with a damp cloth or running the vacuum cleaner over the vents, both high and low. For example, take the opportunity of your spring clean and remove the grills of your air vents and perform a thorough clean. Your vacuum attachments can help you to both reach further into your vents and even to remove any grime which may have accumulated. Mold growth is a big problem for all homeowners, and if not taken care of correctly, can grow and introduce health problems into your home. 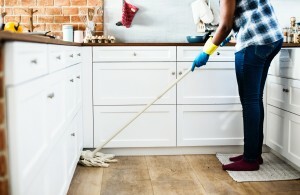 This spring clean, pay attention to all of the cabinets and dark spaces in your home, such as the spaces which house items like your cookware under your benches or your cleaning detergents and items in laundry cabinets. Residue left on pots and pans or laundry bottles which are then put away into dark spaces encourages mold growth which you likely don’t see because it’s at the back of the cabinet or it’s too dark. If, when cleaning your home, you discover water damage, such as a small flood in your basement which you don’t visit often or a leak in your roof which is causing problems with your attic, speak with a professional about its repair. Services like Buffalo Builders, Inc. can provide high-quality professional water damage restoration near Denver, CO. Call today at 866 801 8100 to find out more and to book your water damage restoration service. It’s fair to say that nobody likes to move their heavy furniture items during a clean. And while this is a fair sentiment when speaking about your regular clean, your spring clean demands a little more effort and attention. This year, ensure that you move each and every piece of furniture and clean thoroughly around and underneath it. This is an important tip because there is a lot of potential damage which can occur behind a large furniture item which goes unnoticed for long periods of time. This could include a leaking pipe which is causing dampness on a wall right through to cracks caused by movement. While it can be easy to focus all of your attention and, more importantly, your time, on cleaning the inside of your home, it’s important to remember that the exterior of your home requires maintenance. Take a tour of your home’s exterior and identify areas which need to be cleaned or even slightly repaired. This could be something as simple as using your hose to wash dirt and grime from your home’s exterior to repairing a blocked drain or replacing a cracked tile. Whatever it is, be sure that it gets your attention. If you notice any damage to your home, it’s important to remember that not all work is a DIY task. Before you attempt to do any serious repair or water damage restoration work yourself, speak with Buffalo Builders, Inc. at 866 801 8100 and seek their professional advice. With years of expert experience and professional equipment, trust in their advice and service.